We've all dreamed about having a cinema in our own home, right? Well, you can get one step closer to that dream this Black Friday with this amazing deal on a NOW TV Smart Box with 50% off from John Lewis. The department store has slashed the price of the NOW TV Smart Box by a whopping 50% meaning you can snap it up now for £24.99! But what does that get you? Well, not only will it turn your TV into a smart TV meaning you can find what you want to watch using the voice search, but it also comes with 4K HDR and access to Netflix so you can watch the best movies on Netflix as they were intended. But that's not all. This amazing deal will also bag you some extra bonus goodies, including a 1 month Entertainment pass, 1 month Sky Cinema pass, 1 month Kids pass, and 24 hour access to Sky Sports. Not bad for just £24.99, right? 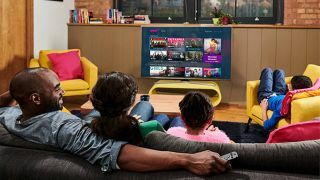 The NOW TV Smart Box let's you mix and match whatever channels you want, without the burden of having to pay for a subscription and being tied down to a contract. You can cancel at any time, too. It’s perfect for those who want a bit of breathing space while someone (naming no names) is hogging the living room telly. And hey, maybe you want something to christen your new purchase from the Black Friday 4K TV deals too? Plus, with the free entertainment passes, you’ll get a nice little taster of what’s on offer for a month, all at no extra cost, including the likes of Star Wars: The Last Jedi, Game of Thrones, and more. If you want something a little cheaper, we can’t recommend the NOW TV Smart Stick highly enough. Perfect for on-the-go use, they come in three flavours: each with the NOW TV Smart Stick, but with a 2 Month Entertainment Pass, 3 Month Kids Pass, and 1 Month Sky Cinema Pass respectively. Any of these would make perfect little prezzies under the tree this Christmas! And don't forget to check out our Black Friday game deals guide for ALL the best Black Friday offers.